The Grasshopper cocktail is a fairly rich, thick, and creamy after dinner drink that combines (in equal parts) creme de menthe, creme de cacao, and heavy cream. The drink reportedly originated at the historic Tujague’s Restaurant and was quite popular in the 50s and 60s. The cocktail fell out of favor, replaced by flavored vodkas and more spirit-forward after dinner drinks. While there are some variations on the Grasshopper (you can make it a “Brown Grasshopper” by adding coffee to the mix), the drink has remained virtually unchanged since its introduction. That is until one fateful night when legendary bartender Audrey Saunders and her husband, cocktail author Robert Hess, walked into the now defunct Vessel bar on a busy night and ordered a “Fernet Grasshopper” from Jim Romdall, an extremely talented Seattle bartender. Not knowing who had ordered it, and being very quick on his feet, Romdall came up with a riff on the Grasshopper that has become The Noisy Cricket. 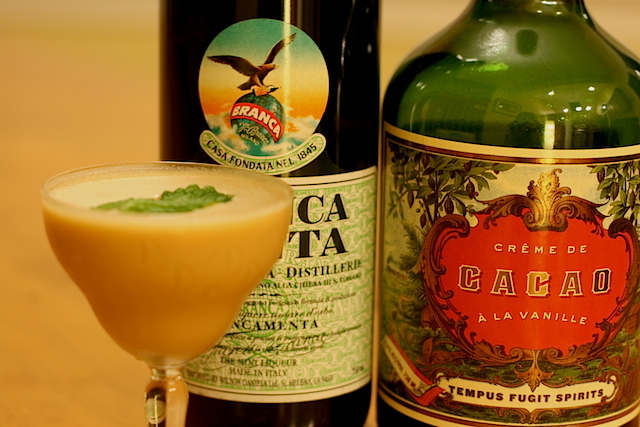 Instead of using Fernet Branca, which can quickly take over a cocktail, Romdall turned to Fernet Branca’s mintier and gentler cousin, Brancamenta. He then turned to Tempus Fugit Spirits‘ Creme de Cacao a la Vanille and then finished with the Grasshopper’s traditional third ingredient, cream. The result is a fantastic cocktail which manages to be sweet and rich, but more balanced than the original Grasshopper. Vigorously shake all the ingredients with ice, strain into a chilled cocktail glass, and garnish with a mint leaf. Brancamenta is a digestif, and so it brings with it some wonderful medicinal qualities to the equation. The bitterness from the Brancamenta also helps balance the drink, making it slightly less rich than the traditional Grasshopper Cocktail (although still thick and sweet). The Noisy Cricket isn’t just a great cocktail, it’s a perfect example of the collaboration that can happen when a savvy customer orders something unique from a talented bartender, with the result being something completely new and original. This Thanksgiving we plan on making The Noisy Cricket the official Drink Spirits after turkey dinner drink.